Delia Smith is Britain's best-selling cookery author. UK sales of all her cookery books total over sixteen million. She has been writing recipes for thirty-four years, having become cookery writer for the Daily Mirror's new magazine in 1969. By that time she had already worked in a restaurant in London, spent a summer working in Italy and researched traditional English recipes in the British Library Reading Room. Her first book was How to Cheat at Cooking (1971) and the following year she started writing a column in the Evening Standard. From the beginning, hers has been a practical and inspirational approach to cooking healthy, delicious food. In 1973 Delia began her television career with a BBC 1 series entitled Family Fare. During this time she wrote several books, including Frugal Food (1976) and Delia Smith's Book of Cakes (1977). Delia's appetising, easy-to-follow recipes were gradually transforming Britain's eating habits. Delia Smith's Cookery Course, first shown and published in three parts between 1978 and 1980, began a television and publishing phenomenon. Since then the hardcover omnibus edition has sold over two million copies. Delia followed this with three more highly acclaimed television series and accompanying books: One is Fun! (1985), Delia Smith's Christmas (1990) and Delia Smith's Summer Collection (1993). The latter broke all her previous records and continues to be a top bestseller all year long. In autumn 1995 Delia Smith's Winter Collection was published, accompanied by a twelve part BBC 2 television series. By January 1996, it had sold 2.4 million copies, becoming the fastest selling book on record. 1998 saw the publication and transmission of the first part of the landmark book and TV series Delia's How to Cook in which Delia gathers together all the techniques, information and recipes she believes people need in order to cook successfully. 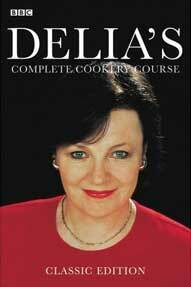 Delia's How to Cook Part Two followed in 1999 / 2000 and Delia's How to Cook Part Three in 2001 / 2002, with combined sales of all three titles reaching more than 3.5 million. Delia's Vegetarian Collection (2002) has sold more than 170,000 copies. Delia is Consultant Food Editor for Sainsbury's The Magazine which she and her husband launched in 1993. The magazine has won numerous awards and now has an official readership of three million. In 1980 Delia put together a Food Aid cookery book as her contribution to the Band Aid charity. And in 1997 Delia's Red Nose Recipes raised over £1 million for Comic Relief. One of Delia's great passions in life is football. She has been a Director of Norwich City Football club since 1996, and in 1999 established Delia's Canary Catering at the Club, which offers a range of business, consumer and conference catering services. In 2001, Delia launched her own website www.deliaonline.com, enabling her to be directly in touch with her readers. Delia received an OBE in the Queen's 1995 New Year's Honours List.